know how to make a gal blush over some ol' cereal box stuff! The sky is stitched with little embroidery knot snow. It uses a gorgeous digital frame created by Maggie (who is Mlamarre Designs). :o) The frame is embossed white--straight out of the printer-- and coloured with copics. Step 1} Print & Emboss the frame. The metallic cardstock I used (Bronze Stardream cardstock from Paper Temptress) lets you emboss right out of the printer & white embossing powder shows up on the dark cardstock. It's like magic! giggle-giggle. --> Use your finger for speedy blending: smudge the copic marker with your finger right after applying a stroke of it. The ink will blend slightly and stay in nooks & crannies for a nice texture & softer lines. 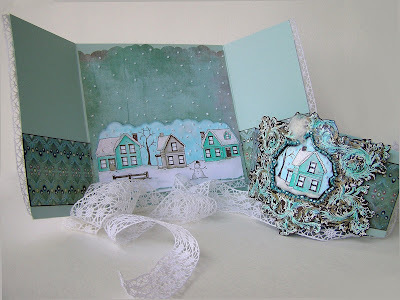 --> Layer colours for shadows: Three turquoise shades were used on this to get shadows in the white embossing. To get shadows of the frame, I used a Dark Bark Copic right onto the bronze cardstock. Step 3} Cut the frame out. Use an exacto knife or hobby blade to cut the middle, if you like. -->My favourite alternative: If you have refills for your Copics, you can paint them right onto the embossing with a paint brush. I only have one refill--so far, hehehe. Step 1} Stamp & colour a scene. This is Winter Neighborhood, by Eat Cake Graphics, from Paper Garden Projects. It's embossed with Chocolate Chip craft ink & clear embossing powder. A) rip the top of a Q-tip or cotton swab (or use a cotton ball) glue it onto the areas where you'd like snow. I used Crystal Lacquer for this. This is basically two simple gatefold cards an outside one (white) and an inside one (blue) In other words, the blue one acts as a liner for the white one.) Lining it lets you stitch both of the parts & hide all the mess easily. I cut crochet trim in half & adhered it to the edges. D) ...putting some quickie glue and glitter to the roofs etc. E) ...sticking some lace on the bottom & stitching. A) Cut two strips of cardstock: the first measuring 2-2/8 x 11 inches (to fold around the card) and the second measuring 2-2/8 x 5-3/8 inches and as a panel on the front. C) Cut a piece of BasicGrey Marrakech patterned paper to measure 2-2/8 x 5-3/8 inches, distressed the edges with a Dark Bark Copic marker, & adhered it to the front panel. D) Adhered the image under the embossed frame & stuck it to the front of the belly-band. WOW....I'm completely floored!!! How do you even keep up with yourself ;) LOL! ROCK ON! When I think you can't possibly out-do yourself, you do! Amazing card. pure genius once again me dear!! Mel, your card/project is absolutely stunning!! You did an awesome job. Wow Mel! Another stunning creation..love every detail of this card! I can't wait to try your techniques! Thanks again for your inspiration! You rock Mel! This is absolutely stunning!! Great tutorial!! It's no wonder you are tired and not feeling well often - you out-do yourself on these projects!!! WOWZERS! this is amazing! Go take a nap - you deserve it! OMG!!! Girl it would take me a whole week to sit down to copy one of your cards :), this is fabulous. How long does it take you to do a card? WOW! Fabulous! The frame on the band is gorgeous! You are genius, Mel! Pretty. It's that time of year isn't it, to see Xmas cards and such. Love the inside of the card. Those houses are so adorable!! WOW this is amazing! so much work, but the finished effect is sooo worth it! its gorgeous! Wow Mel you definitely rocked this challenge GF you just never cease to amaze me love how you used Maggies frame awesome card. okay...lah de dah...I am sitting at work trying to work and scroll through my google reader nonchalantly when URCHHHHH...I see this wonderful creation on the CB site...I knew it had to be a Mel original. This is just gorgeous...good thing I didn't scream out loud OH MY GOSH and give myself away LOL! You are absolutely amazing. That is a beautiful card. I honest to goodness do not know how you do it! well, I do know how because you gave WONDERFUL instructions ... but every project you make is so AMAZING and perfect ... time consuming .. but so worth it. I hope I one day am not too intimidated to try a project like this .. down to the knots! I LOVE this!!! I got a scor it today ... so I may try that project you made with the scored grid and beads.. maybe :) lol! Thanks for the constant inspiration, fun and such wonderfully detailed projects!!! This is so gorgeous, Mel!! Really beautiful!! You did an amazing job! you're knot?! r u sure? WOW--Mel: you're amazing; the whole card looks like it's glittering; thanks my blogger friend, for sharing, what looks like a very time consuming card! Holy Moly, I am in awe of all the techniques that you know. Your card is AMAZING. What a wonderful card - I'm at a loss to describe it! Great job!!!! Wow Mel!!! This is GORGEOUS!!! But then so is everything you make! Each of your creations should be framed like a tiny piece of art!! Holy smokers! Saw this on the Cuttlebug blog, and just had to pop in and say WOW!!!! Totally fantastic, inside and out! I love every detail!!!!! i am officially in love with this card. this is just gorgeous, beautiful, out of this world Mel!